The Encyclopedia of Insects is a comprehensive work devoted to all aspects of insects, including their anatomy, physiology, evolution, behavior, reproduction, ecology, and disease, as well as issues of exploitation, conservation, and management. Articles provide definitive facts about all insects from aphids, beetles and butterflies to weevils and yellowjackets. Insects are beautiful and dreadful, ravenous pests and devastating disease vectors, resilient and resistant to eradication, and the source of great benefit and great loss for civilization. Important for ecosystem health, they have influenced the evolution of other life forms on our planet including humans. 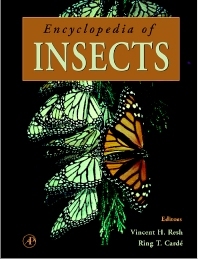 Anyone interested in insects, from university professors and researchers to high school students preparing a report, will find The Encyclopedia of Insects an indispensable volume for insect information. All levels of university students, researchers, and professional entomologists. Also pest management officers in agrobusiness or government. Ideal for public, academic, and government libraries.